Sunday greetings from one very hot reader. Here in the UK we’re going through a very hot spell and unusually this one is sticking around for a while. Even though my garden is in desperate need of some attention it’s far too hot to do anything much beyond pruning the rose bushes and deadheading some border plants. On a day like this there really is only one thing in the garden I want to do and that’s to sit in it with a good book and a glass of something cold. Which makes it fortuitous that I stocked up my reading shelves yesterday. I can hear you saying “I thought you weren’t buying any books till you’d cleared that TBR collection?? ?” I have indeed been doing well on that front – more on that another time – but I had gone to the library to pick up The Spinning Heart by Donal Ryan which had finally become available and then found the library was having a book sale. I couldn’t resist taking a look as you might expect and found some titles that will be good additions for my world literature reading project. So now I’m set up for a lovely few hours of reading. And all I have to decide is which of these to open first. The Flying Man by Roopa Farooki. This was long listed for the Orange Prize for Fiction (now renamed the Baileys Prize) in 2012. This is the fifth novel by Farooki, who was born Pakistan to a literary family but now lives in London. It’s about a somewhat shady character who travels around the world adopting a different persona in each country. A book by another Pakistani author caught my eye. Burnt Shadows by Kamila Shamsie was shortlisted for the Orange Prize in 2009. It’s a noel about the shared histories of two families, moving from the final days of the second world war in Japan, and India on the brink of partition in 1947, to Pakistan in the early 1980s, New York in the aftermath of September 11 and Afghanistan in the wake of the resulting US bombing campaign. I’ve never read anything by Mario Vargas Llosa, the 2010 Nobel Prize winner for literature , nor have I read anything by a Peruvian author so when I spotted Llosa’s The Dream of the Celt, it seemed an opportunity too good to miss. It actually isn’t set in South America but in Ireland where a hero of Irish Nationalism awaits the hangman’s noose having been convicted of treason. I would have been happy with just those four but the library was offering a discount if you bought five so onto my pile went one book that has nothing to do with world literature: Jennifer Egan’s Look at Me. I have A Visit from the Goon Squad but have yet to open it so I have no idea whether I will like her style. This one predates Goon Squad by 10 years. It’s about a model who is trying to return to life after a catastrophic car accident which so badly impacted her face, she needed 80 screws to fix the back in place. Unrecognisable and unable to return to her former work, she drifts into drink and despair. If these were your new acquisitions which would you read first? I had good intentions of writing this update yesterday but candidly I was too tired by my day at the Mondrian exhibition in the Tate in Liverpool. I do enjoy going to art exhibitions but still find them exhausting. Sometimes it’s because of the crowds which the big events always attract so you have to jostle to get anything like a decent view of the works. Sometimes though it’s just that there are too many items and it gets overwhelming. But, as was the case yesterday, my brain just gets overwhelmed trying to grasp the concepts behind the artist’s work. I read the explanation of Mondrian’s theory of neo plasticism three times but still have only a vague idea what he meant. Aside from this short break, I’ve not had much time tor anything else recently including visiting blogs I follow and enjoy. The stack of books I have yet to review keeps creeping up too. The good news however is that I’ve made some more progress with my world literature project. 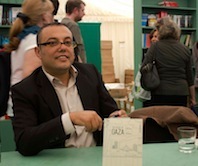 At the Hay Festival a few weeks ago I listened to a fabulous discussion with Atef Abu Saif, the editor of the first anthology of short stories by Palestinian authors. He spoke so movingly about the difficulties these authors face in getting their work published that I immediately went out and bought The Book of Gaza. Unusually for me I also read it over the next few days. I’ve also been participatin in Spanish literature month which is co hosted by Stu at Winston’s Dad blog http://winstonsdad.wordpress.com and Richard at Caravana de Recuerdos. 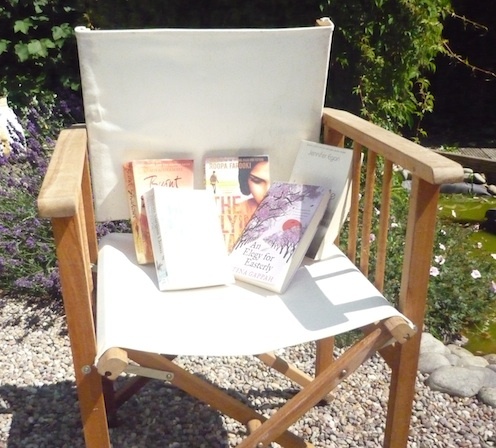 http://caravanaderecuerdos.blogspot.co.uk/2014/05/spanish-lit-month-2014. It’s given me the nudge I needed to dust off a copy of Isabel Allende’s The Infinite Plan which has lingered on my shelves for three years. I don’t dislike it and can see why so many other people love her work but it hasn’t wowed me. As for my next read, I’m still trying to make my mind. I have a long trip to Asia starting at the end of this monotheism which will mean lots of flying hours so I need to chose a few good bookish companions. Robert Graves Goodbye to all That will be one since it’s the next book club choice but I keep changing my mind on what else to take. Elizabeth Gaskell’s Wives and Daughters is one option. Anyone read it and if so would you recommend it? If you want to read a classic of Brazilian literature, then it has to be Dom Casmurro by Joaquim Maria Machado de Assis. Never heard of him? Not surprising — on the rare occasions when you come across anything about literature from South America, it will typically reference the big names like Colombia’s Gabriel García Márquez or Isabel Allende from Chile. As for Brazilian writers, about the only one to get much world wide attention is Paulo Coelho. This is a novel in the realist mode that ranks alongside many other great nineteenth century novels like Madame Bovary or Anna Karenina which similarly focus on love, marriage and adultery. But the similarity only extends to the theme and not to the way de Assis handles his subject. The novel purportes to be an autobiography written by Bento Santiago, a lawyer from Rio de Janeiro. We meet him as a semi reclusive man in the maturity of his life, the occupant of a substantial house built as a replica of his childhood home. He is alone, with few friends still alive. After years of wedded bliss to a childhood sweetheart, he suspects that he has been cuckolded; that his wife Capitú, has cheated on him with his best friend and that her child is not his. Writing, he decides, will relieve the monotony of his life. Ideally he wants to write something about jurisprudence or politics but that will require more energy than he has available right now; so instead he opts for the easier path of recording reminiscences from his past. Through the narration that ensues, we follow him from his early adoration of Capitú, the girl next door who he believes similarly adores him. They cannot declare their love publicly however — his mother has him marked down for a glittering career in the church and would not welcome any disruption to those plans. So off he goes to the seminary, the first stage of the journey towards accomplishing the vocation his mother is sure is his destiny. Bento of course has other plans and the rest of the story traces his desperate efforts to keep Capitú’s affection, win over his mother to his plans, and marry the girl of his dreams. Described in such terms would suggest Dom Casmurro is a straight forward linear narrative. Far from it. The chapters are very short (some in fact just one paragraph long) and not necessarily connected to each other by the order of the events they supposedly relate so undermining the usual ‘beginning, middle and end’ way of narrating. Machado also plays with his reader’s expectations about the traditions of a love story, confounding those expectations by making Bento so completely unreliable as a narrator that we question whether there really was any grande passion with Capitú. Bento says his version of events is ‘the unvarnished truth’ and yet he admits that he has a poor memory, unable to remember even the colour of the trousers he wore yesterday let alone the colour of his first pair. Once we begin to doubt his veracity on the nature of his early relationship with Capitú, then the field is wide open to question whether she really is an adulteress. Is this a figment of Bento’s over active imagination? Inventive he certainly is. He frequently digresses from the story of his love and his life to pontificate on Brazilian life and society or about ministerial reshuffles, slavery, the need to re-write Othello and train travel. Beneto is someone inclined to chatter about anything that just pops into his head, regardless of whether it has anything to do with his story. Reading this novel I gained the distinct impression that Bento – and Machado – were inviting the reader to understand that their story was a complex series of illusions, that nothing is really what it seems. Shake your head reader; make all the incredulous gestures you like. throw the book out even, if boredom hasn’t made you do it already; anything is possible. But if you haven’t done so and only now do you feel like it, I trust that you will pick the book up again and open it at the same page without believing that the author is telling the truth. In questioning the narrator’s ability to accurately render the very events they are meant to be presenting, Machado also draws attention to the way in which the whole process of writing is an artifice. Mischevious. Quirky. Puzzling. By the end of Dom Casmurro I wasn’t absolutely sure what kind of book I had just read or what was true and what was fabricated. But I did know I had enjoyed being led down many garden paths.